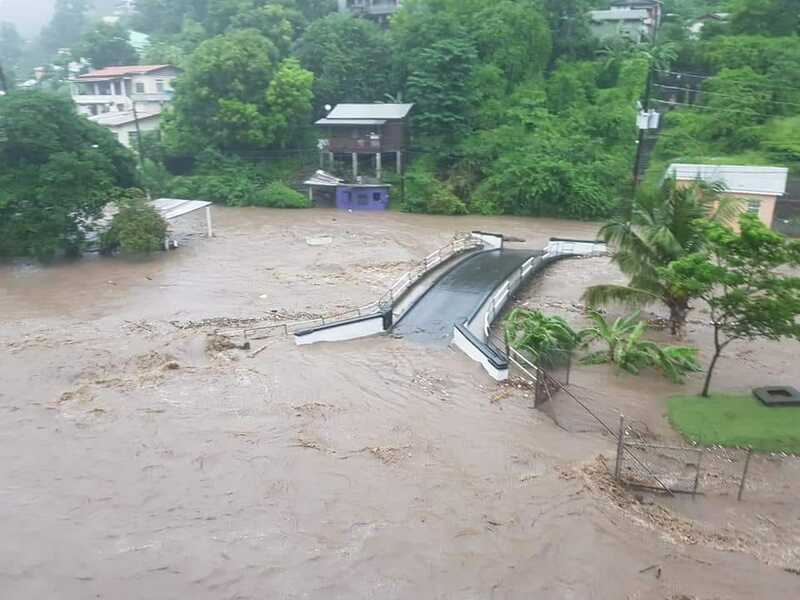 ST GEORGE’S, Aug 08 (IPS) - Grenada is still tallying the damage after heavy rainfall last week resulted in "wide and extensive" flooding that once again highlights the vulnerability of Small Island Developing States (SIDS) to climate change. Officials here say extreme weather events like in 2004 and 2005 are still fresh in the minds of residents. Rising sea levels are leading to an erosion of coastlines, while hurricanes and tropical storms regularly devastate crucial infrastructure. For three hours, between 9 am and 12 noon on Aug. 1, a tropical wave interacting with the Inter-Tropical Convergence Zone, lingered over the island, dumping several inches of rain, which resulted in rapidly-rising flood waters. The Maurice Bishop International Airport Meteorological Office recorded six inches of rain over the three-hour period, and officials said the interior of the island received significantly more rainfall. No recording of the island's interior was immediately available. "The flooding was wide and extensive," senator Winston Garraway, minister of state in the ministry of climate resilience, told IPS. "St. David and St George were badly impacted and we have decided that both areas will be disaster areas." In St. David, Garraway said there were 60 landslides, and these have impacted on the road network in the parish which is the country's main agriculture zone. A total of nine homes in both parishes have been badly affected and families had to be relocated, Garraway said, adding that disaster officials are looking at either demolishing and rebuilding or relocating homes. "The national stadium took a bad beating from the flood waters and this is likely to impact on activities going forward in the immediate future," Garraway said. Damage to the ground floor of the stadium also led to the postponement of one of the main carnival events. Garraway, who also has responsibility for the environment, forestry, fisheries and disaster management, said the weather event was another clear remainder that Grenada and other SIDS are among the countries most vulnerable to climate change. "We have been one of the strong proponents of the impact of climate change, so we've been training our people as it relates to mitigation measures. But we had so much rain over such a short period, the whole system was inundated, and it speaks clearly to the effects of climate change," he said. "One might ask, was there any chance of us mitigating against some of these challenges that we have seen? In some sense, I think yes, in a large sense, no. The system could not have absorbed the amount of water we had that short time." The minister of communication, works and public utilities, Gregory Bowen, agrees with Garraway that events like these highlight the effects of climate change on SIDS. Bowen said there is an urgent need for grant financing to help at the community level. "A lot of the flood waters passed through private lands. The state is responsible for state properties, but for private people, the size of drains that would have to run through their properties, they can't afford it," Bowen told IPS. "So that is one area that we have to work on, getting granting financing to help the people. Because the rains come, and it will find its own path and it's usually through private lands. If you have good drains you could properly channel the run off. "So that is one critical component that we have to move on immediately. Millions of dollars are needed to be spent on that," Bowen added. But he said the island simply cannot afford to cover these costs, noting that Grenada only recently concluded a three-year, International Monetary Fund supported Structural Adjustment Programme. While the formal impact assessment is still being done by the ministry of works in collaboration with the ministry of finance, officials here have already reached out to regional partners for support. Garraway said officials at the Barbados-based Caribbean Disaster Emergency Management Agency, have been in touch with local disaster management officials to ascertain the extent of the damage and the immediate assistance needed. Meanwhile, epidemiologist in the ministry of health, Dr. Shawn Charles, has advised residents to stay away from the stagnant water resultant from the flooding. He warned that they may not only be contaminated with debris such as broken bottles and plastics, but pathogens that can cause life-threatening conditions. "Flood water from the level of rainfall we received from that tropical wave is normally contaminated with all kinds of things and it's not wise for anyone to expose themselves to it. There are all kinds of contaminants that can impact differently, so swimming, running and doing other things in that type of contaminated water should be avoided," Charles told IPS. "One of the life-threatening contaminants in flood water is droplets and urine from rats and that is the main transmitter for leptospirosis, and that disease can cause death. So, it's not advisable for a person to just go about exposing themselves to flood water. It is just not wise; it can result in sickness. People need to be very cautious. Personal contact with flooded water should be avoided."